Russia five weeks ago blocked the draft text of a UN Security Council declaration of alarm over the blockade of Qusayr (see my June 2 post). Within days, the town close to the Syrian-Lebanese border fell to the combined forces of the Syrian regime and Iran’s Lebanese Hezbollah. This week, Russia blocked the draft text of a UN Security Council declaration of grave concern about the civilians trapped in the besieged city of Homs. This probably means Moscow expects regime and Hezbollah forces to imminently route opposition rebels from Syria’s third largest city, which they have been pummeling for nearly 10 days. Regime and Hezbollah forces control parts of Homs, while several neighborhoods in the center are opposition strongholds. Council statements must be agreed unanimously. The members of the Security Council express their grave concern about the estimated 2,500 civilians trapped in Homs as a result of the recent heavy fighting. The members of the Security Council call upon the Syrian Government to facilitate immediate, safe and unhindered access, in accordance with the United Nations guiding principles of humanitarian assistance, for relevant humanitarian, including UN, actors, to reach civilians in Homs, in urgent need of assistance, in particular, medical assistance. The members of the Security Council call upon all parties in Syria to do their utmost to protect civilians, including allowing them to leave Homs and avoid civilian casualties, recalling the primary responsibility of the Syrian Government in this regard. They emphasize that those responsible for violations of applicable international law will be held accountable. Russia’s UN Mission said it proposed an alternative statement, which called for immediate access to Homs as well as the predominantly Shiite government-controlled towns of Nubul and Zahra that opposition fighters are seeking to take. 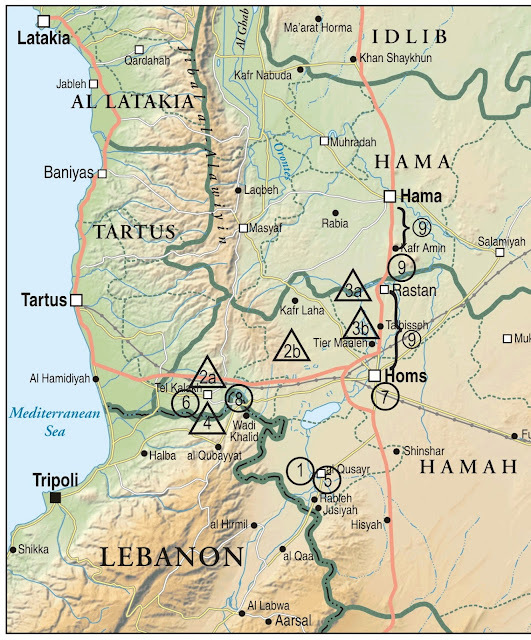 An eye-opener on the regime’s renewed offensive in Homs is a news analysis by the Institute for the Study of War authored by Elizabeth O’Bagy, which you can read in full here. Activists in Homs city said all cellular lines were cut early on June 29 before airplanes pounded rebel-held districts in the city. Before government troops could advance, intense shelling with artillery, mortars, and tanks followed the two-day-long air campaign. "This is the worst campaign against the city since the revolution began," said an activist in the rebel-held old quarter of the city. Rebel commanders reinforced this message, adding that the regime has significantly accelerated its operations in Homs province in the past week, and has brought substantial forces to bear, aided by both air superiority and Iranian, Hezbollah, and Iraqi irregular forces. Although rebel fighters are sufficiently entrenched in Homs to ensure a prolonged fight for the city, the opposition currently lacks the requisite arms and supplies to hold off the offensive for an extended period of time. The delaying action in Homs is strategically significant because it gains the opposition time in Aleppo, but if the regime is able to consolidate its hold in Homs city and the countryside, it may be able to secure its lines of communication in ways that make its ultimate offensive in Aleppo more effective. The factor that will most limit the regime’s ability to redeploy assets from Homs to Aleppo will be holding cleared terrain, which can be time consuming and troop intensive. In addition to ongoing operations, the Syrian government has also been attempting to shore up its military success in Homs province by repopulating the towns and villages that come under regime control with Alawites. With the battle for Homs raging on, the Syrian National Coalition yesterday elected Ahmad Jarba, 44, as its new president after a close runoff vote held in Istanbul. Jarba, who represents the faction of veteran secular dissident Michel Kilo and has Saudi connections, obtained 55 votes – three more than defeated businessman Mustafa Sabbagh, Qatar’s pointman in the opposition. The 114 members of the coalition also elected three vice presidents -- Suhair Atassi, Farouk Tayfur and Salem Muslit. Badr Jamous was voted secretary general of the umbrella organization officially recognized by the Arab League and dozens of states and organizations as the legitimate representative of the Syrian people.